The mechanical structure of the 959 is partly related to the original 911, but with a series of modifications. 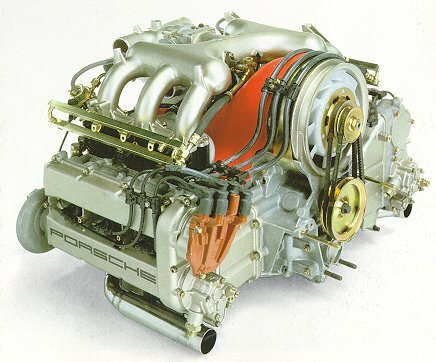 The engine which is connected to the basic steel chassis is derived from the racing 935/936/956/962 rather than the road 911. The 959 is a 6-cylinder boxer, in the Porsche tradition, with a displacement of 2851 cc (bore/stroke 95 x 67 mm). 959 cylinder heads are individual, for each cylinder, the combustion chambers have four valves per cyl (with sodium inserts for the exhaust valves and a hydraulic system to up play) for better filling. This requires two camshafts per bank by a double chain) and a liquid cooled system for the cylinder heads. 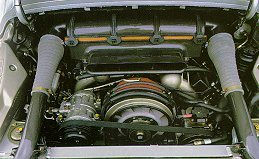 As been discovered when building the valve engines for the 935 and the that followed, air (normally used cooling the cylinders) was not cap lowering the temperature of this intricate structure far enough. The geometrical compression ratio is effectively 13.5:1. Average piston at 6500 rpm is 4.5 m/sec, maxim utilisable power is at 7600 rpm, a mechanical maximum is at 8200 r The exhaust gases are taken by t manifolds to the heart of the supercharger, composed of two turbines of the same size which function sequentially and not in parallel. This system is the result of extended and is aimed at getting rid of the fault of turbo-compressed engines, lag. The gap that occurs at low s between pressing the accelerator getting the response from the en caused by the fact that one of the turbines operates constantly even pressure, as it receives the press the exhaust gases through the op of one valve and the simultaneous closing of another valve upstream second turbine. Up to 4300 rpm turbine is working, and produces continuous boost; above this engine speed the second valve opens and second turbine starts to function, after a second valve downstream opened produces more pressure in the feed conduits. Naturally, once the turbine has started to function, p is equalized by an electronically controlled by-pass valve, and at t point the two turbines work in p The maximum supercharged pressure 2.0 bar, is reached under 4300 rpm at higher speeds the maximum pressure is 1.9 bar. These pressures are (electronically) controlled by a wastegate valve. The compressed air in the two turbines first well-cooled by two intercoolers cleverly placed behind the rear w at the sides of the engine, travel feed system, which is based on a development of the famous Bosch Motronic injection. This system in connected in a complex manner to the system which controls the boost pressure, and to the regulation of the valves - the spark advance etc. - in order to exploit the engine to the maximum, and to obtain high performances with reduced fuel consumption, and the cleanest possible exhaust emission. The lubrication of the 959 engine has naturally been the subject of much research, and has directly benefited from experience gained on the racing models. Dry-sump as always, the system is remarkable for the presence of no less than five sump oil suction points, so that no oil stays in the crankcase to form foam. There are two oil radiators, in the nose, which help to cool the oil (the temperature is raised considerably by the fact that it acts as an auxiliary radiator for the lower part of the pistons). The 959 has a steel driveshaft, with seven bank supports. The light-alloy cylinder barrels are lined with "Nikasil", the choice at Porsche for many years now. Conceived and built in this way, the 959 engine betrays its family connection to the racing models more than anything else in the vital statistics on its technical chart. The 2.85 litre engine has an output of 450 HP (against 231 for the aspirated Carrera 911 and 300 for the 3.3 Turbo 930) at 6500 rpm, approximately 185 HP/litre, with maximum torque of no less than 500 Nm at 5500 rpm. 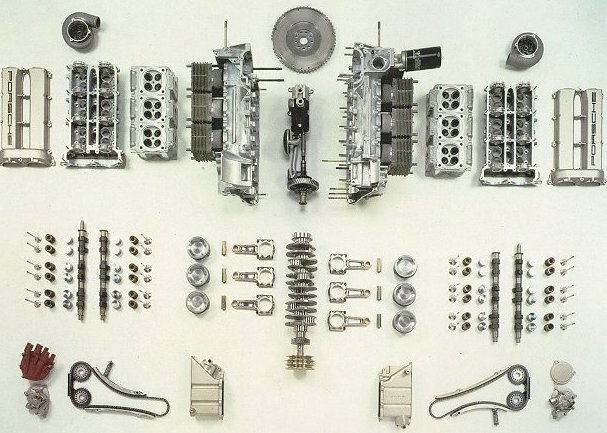 The latter sensational figure produced a whole series of problems for the Porsche engineers when it came to finding a clutch and gearbox up to the task. It was finally decided to mount a hydraulic single dry plate clutch, diameter 240 mm. A new 6speed+ reverse gearbox was designed, in view of the many different tasks the car would have to affront. The choice was motivated by the need for a wide range of ratios, notwithstanding the engine's generous torque, in order to adapt it not only to the vast range of speeds (up to 300 kph) of which the 959 is capable, but also to the possibility of the car being used over rough ground. With this prospect in view, the very short first gear can be considered simply a "reduction", while the normal gears start from second (which is a more normal 17/35, and in which the 959 reaches 103 kph). But the 959's most important technical innovation is the transmission, characterized by the adoption of four-wheel drive. The fact the 911 has a well-tested mechanical plan with rear engine and front-wheel drive, the perfect lay-out for fitting four-wheel drive, was one of the factors that made it the choice for the development of the 959. The movement of the driveshaft, once it has been "worked" by the gears and passed to the rear wheels, is transmitted to a strong transmission axle which passes through the car's centerline. The front differential, which distributes the power it receives to the wheels, has been modified in such a way as to make the classical third longitudinal differential unnecessary. The job of distributing the movement equally between the front andrear axles is in fact taken over by a brand new clutch called the "PSK", which stands for Porsche-SteuerKupplung, i.e. Porsche command clutch. It is a particularly interesting component, as its structure allows direct control of its working. It consists of 13 plates, seven outer and six inner, in an oil bath, with modifiable reciprocal slippage. This is what makes the power distribution to the front axle variable with respect to the rear axle, and the whole thing is controlled by an electronic circuit in turn governed by the on-board computer, which varies the pressure of the group of plates through an electric servomotor and a hydraulic actuator. This means that theoretically it is possible to go from an exclusively rear-wheel drive situation (0/100 distribution) to a perfectly symmetrical one (50/50). In practice a certain amount of movement is always transmitted to the front wheels, the group is never completely disengaged and the distribution limit is 20/80. A microprocessor connected to the on-board computer collates the information that it receives from sensors on the accelerator pedal, on the wheels	(rotating or still) etc. As a wheel is about to stop, the computer reacts by	blocking the rear differential or the PSK	group (as necessary), to help maintain traction even on uneven surfaces, while	accelerating hard, and other such limit	situations. The type of distribution	amongst the four wheels is chosen from	four programmes by the driver, using a	command by the steering wheel. These	correspond to different surfaces and	then to differently regulated slippage	permitted by the PSK and/or the	conventional self-blocking differential. The system gives perfect traction in any	condition, and more importantly, the regulations can be altered by changing a	chip in the computer.